"Bring back our girls" and "solidarity forever" were the phrases chanted by protesters who gathered to unite against the abduction of some 200 schoolgirls from Nigeria. 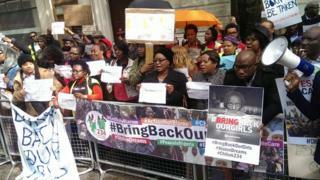 The crowd amassed opposite the Nigerian embassy in central London, as experts from the US and UK arrived in the African country to join the search for the missing girls. Militant Islamist group Boko Haram has claimed responsibility for taking the teenagers, who were kidnapped from their boarding school on the night of 14 April. Since then the Nigerian government has been criticised for being slow to react to the crisis. Artist and writer Esther Wright, who is originally from Delta state in Nigeria, was among more than 100 people at the protest. She said: "As I'm talking to you right now these girls are probably getting raped. "This is a real emergency, more needs to be done. I am a woman, you cannot treat women like this in today's world." Mrs Wright, who settled in the UK in 2012 after getting married, was one of many who had turned up with handmade placards and posters. But it was a tweet sent by 30-year-old Raliah Adeyemi of east London that got the protest happening in the first place. "As soon as I heard about the schoolgirls I wanted to try and help," said Miss Adeyemi, who came from Nigeria to the UK in 2002 to go to university. "I didn't want people to forget about what was happening with these girls, so I went on Twitter and said we should stage something in London, and the whole thing snowballed from there." Image caption Miss Adeyemi said Islamist militant group Boko Haram were giving Muslims a "bad name"
Media captionOne protester said the government was "just sitting there, doing nothing. It's totally unacceptable"
Miss Adeyemi, who studied at universities in Westminster and Manchester, said she had several family members living in Nigeria, including more than 20 cousins some of whom were between 16 and 18 years old - the same age as the kidnapped girls. "It really makes you think, it could have easily been my cousins caught up in this. My heart goes out the families affected." Miss Adeyemi, who works in IT for an investment bank, is also a practising Muslim, and she said that atrocities such as this, were giving her religion a "bad name". "They do not realise the damage they are doing. People will grow up thinking Islam is a bad religion, they won't understand. The international community needs to come together to stop this." Midway through the protest the demonstrators were joined by MP for Tottenham, David Lammy who addressed the crowd and criticised the "pernicious evil" that had led to the abductions. He said that social media had "made the world small", and it was because of protests such as this that the UK had pledged to try to help find the schoolgirls. The UK has sent a team to provide planning and advice on co-ordination to the Nigerian authorities. "A week ago the international community were doing diddly squat, now we have got some action. And I will making sure the government pushes even further to try and find them." His words were heard by 64-year-old retired nurse Sheila Atsu of Wandsworth, who is also originally from Nigeria, but left for the UK in 1970. She said: "The Nigerian government should have done more at the very start of this crisis to try and find the girls. "People are not going to stop fighting until they are released." And her view was shared by Josephine Dolan-Dufourd, 35, of Dalston, London, who turned up at the protest with her three-year-old twins Milo and Elliot. She said that although she did not have a Nigerian relative, she was still concerned by what had happened, and wanted to show her support. "It's important at times like this, no matter what your faith or background, to come together and support a unified cause," she said. It is believed the girls are being held somewhere in the forested areas which stretch from near the village of Chibok in Borno state of Nigeria, into neighbouring Cameroon. Nigeria's president Goodluck Jonathan has vowed to find the missing schoolgirls and return them to their families, and he has thanked those countries who have offered to help locate them. He said on Thursday he hoped that foreign assistance would signal "the beginning of the end of terror" in Nigeria.